Use any of the products from McArthur Skincare and if you are not satisfied, return the item for a full refund under our Returns Policy. 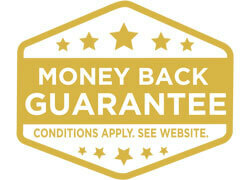 The Money Back Guarantee is valid for purchases within Australia and only applies to products purchased online from McArthur Skincare or from an authorised stockist. The claim for a refund must be made within 60 days of the purchase date. Refund does not include any postage charges you may have incurred when purchasing or returning the product.